Lighting-Gallery-net - circline and u-bent fluorescent tubes/Philips 32w circline made in China. Out of round. What a joke. Philips 32w circline made in China. Out of round. What a joke. Shame this had to happen. Someone should buy them a quality compass. They obviously need it. Not the dollar store math set junk, a proper Staedtler or similar ! I bet this lamp fits poorly in some fixtures (dependant on fixture design). That's disappointing. 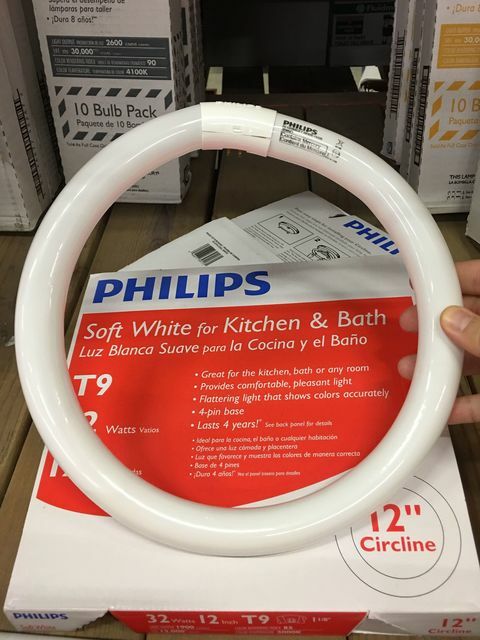 I put a Philips circline (from Thailand) in my kitchen fixture. This was after I returned a couple Sylvania lamps due to poor quality. This is still a CFL- and LED-free zone! Total failure or inexistance of quality control. The workers in the factory seem to have smoked something funny before adjusting the machines. Should it be a true Philips product the Philips people shoud be ashamed about bringing such lemons on the market. This week I ordered 60 new 40w watters. I hope they have a proper round shape as otherwise they won’t fit in the fixtures. I did not get them yet. But soon. The ones I ordered (Philips TLE 40W/840) might be from Thailand, same as the the previous ones. But who knows, quite possible that we get chinese ones as well now. Philips apparently closed the Thai fluorescent plant. Our Philips circlines used to be made there. Now they're made in China. Oh no! Didn’t know that they closed. So is there any other factory in the whole entire world which makes circlines beside the chinese Philips? These would never work in my vintage fixtures that have stationary plugs! My very first word was LIGHT! @Dimbulb: I had a hard time getting them to fit and work correctly in my vintage circline fixtures (they all have stationary plugs) at the paintball field. The topaz ones were much better. Introducing a new fluorescent lamps type, the “ovalline.” Epic Chinese fail. Power provided by Alabama Power, 120 volts 60 Hz. House is an LED free zone, tungsten and linear fluorescent only. They are probably making the LED stuff better, they are just intentionally ruining the quality of this stuff to get people to buy more LED. What a hideous looking lamp! Ovaline, LOL! (Actually there is such a thing as an oval fluorescent). I've wondered too if it is intentional to try to force people to abandon "old" technologies and switch to LED. I think though it's more likely a decline in quality in general, in the name of decreasing expense and increasing profit. Like the ever decreasing size of candy bars and thinning of plastic bags and aluminum foil. Just when you think they can't make something cheaper, they find a way. It just doesn't seem worth buying any new fluorescent, HID or incandescent lamps or the crappy ballasts on the market now. I bought my last retail HID lamps last year....no more for me. The lamp quality is just horrendous now and they don't look good in fixtures, don't fit right, have ugly etches, and short life. Some probably stress ballasts too. At least I hope they reach their life of 2 years constant running like those do made in Thailand. I have 67 lights which are installed in a underpass in our city and none of them failed but they got a little bit dimmer as they age. I just realized that it is not worth it going and buying new lamps these days. All that t8 garbage everywhere I look in my country. I really want to find some corned shop who still sells t12 tubes til this day in my country, because I don't want tp use my vintage NOS tubes. I could buy t8s but I just can't stand them! They look ugly in vintage fixtures. It's just not right. But hen again, with today's quality, if I were to find modern t12s in my country, they would be a shi*ty as modern t8s and burn out after 6 months of use..
Vytautas what T8's you have there ? Other than they don't look "right" in some luminaires, are there starterless luminaires in Lithuania that really have functional problem with T8 ? Are US made circlines perfect? No. They still got their flaws. I've seen plenty of out of round US made circlines but the bottom line is they far outlast any Asian made circline or even linear for that matter. I also did notice that modern T8 osram, philips and other 'real' manufacturers produced tubes are of 'good' quality, but not as good in my opinion. I mean, I take my school as an example: in 2012 they renewed their old soviet fixtures with new modern Chinese made flimsy cheap preheat start t8 fixtures. They installed German made Osram lumilux tubes in them. At first they seemed fine, they looked nice and were bright. But the tubes themselves, that were made in Germany, supposedly "very good quality" tubes started failing at a year mark. They lasted one school year and at the and some tubes started flashing EOL. How is that not supposed to cast "modern tubes don't last" shadow on modern tubes? I know that frequent on and off and long times of being lit in winter times in schools probably contributed to these tubes failing quicker, but that is still nowhere close to Soviet and vintage 1990s Tungsram, Pila and Tesla tubes lasting at very least 7 years on preheat with school abusive use. Why can't they make tubes of the same quality today? Who knows. But it shouldn't be that hard to make a long lasting tube, I mean you just make a thicker filament with more coils for more emitter and that's it. But I think economy is the culprit here. If they make tubes that were needed to be replaced only once in a decade the earnings would be minimal, and none wants that these days. As regarding Chinese tubes lasting a moderate time, well, I sorta agree with you on that, but at the same time I don't. You see, the longevity of the tube rotates around what fixture it was installed in. If the fixture is old, that means it has a powerful ballast, that is designed for older tubes with thicker filaments. So they preheat the ends with more current and run the tube at the higher voltage. If the fixture is new, and has modern preheat ballast, then it's fine, because it is designed for t8 tubes and t12 tubes on it is under powered most of the time. Wether the chinese t8 tube was installed in new or old fixture judges what life it will have - long or short. I have installed some Chinese "Spectrum" T8 tubes in modern preheat fixtures in my home, and they have started their second year working fine. They are moderately bright and have moderate CRI. However, two years is nothing to brag about, because the ends are now pretty blackened, and they flicker more than usual, so they are at their last breath until EOL. On modern preheat ballast they preheat fine, endfs glow just a bit so emitter is not sputtered off during preheat. That means longer life, that is moderate. Two years is a pretty moderate lifetime on a tube that is made in China and costs a bargain of 2 dollars for 4ft tube. However, on older/vintage fixtures that is a whole other thing. You see, Chinese tubes have thin filaments. That means on powerful ballasts that were designed for t12 tubes, they preheat very brightly and loose emitter very fast hense rendering the tube EOL in just a few months. I have seen in my school Chinese tubes installed in soviet fixtures, that were designed for thick double coil filament t12 tubes and they have very powerful massive ballasts inside. The t8 tubes during preheat glows so bright that ends start rectifying. I have seen how the T8 tube is preheating longer periods on a slow worn out starter and the ends starts releasing purple flashes of light and I even saw once the end starting to rectify and it shut down. The filament broke on too powerful vintage ballast. Chinese tubes don't last more tahn a couple of months on old powerful ballasts. So it is really difficult to judge truly how long does Chinese tubes last. Regarding vintage fixtures in Lithuania, all we have of vintage is only Soviet made. Soviets never made any other type of fluorescent ballast other than preheat type. Yes, they made a somewhat rapid-start resembling starterless ballast for streetlights that used fluorescent tubes, but they were made only for 40 and 80 watt tubes, and they were only installed in streetlight fixtures, they were never installed in normal fixtures, because they were huge and required many materials to make. All soviet vintage fixtures were made with preheat ballasts and used starters, and that is why I don't like installing T8s in soviet fixtures. They look awful, simply because the space between the reflective white painted body of the fixture and lamp holder diameter was so to make the t12 tube s fit perfectly with minimal residual space. And installing t8 tubes in those fixtures just looks so out of caracter and so wrong that it makes me angry. Also, soviet vintage ballast were not designed for t8 tubes. They were designed for t12 tubes, and that is why there is another problem with t8s in vintage soviet fixtures - they struggle to start. The magnetic preheat ballasts were made with parameters for t12 tubes, for quick start, minimal humming and minimal flickering, and when t8 is installed the ballast are humming more violently creating more sound. I have many soviet vintage ballasts that work silently and with minimal flickering with t12 tubes, and they buzz like crazy and struggle to start with t8 tubes, because they are not designed for t8 tubes. The t8 tubes are overdrived on these ballasts, they preheat violently and the tubes fail faster than usual. So the moral of the story is - I don't like t8s. Ever tried to install T8 with protective sleeves ? seen them in use before... except from a YouTube video I saw long ago from a member on here. I don't remember who that was though.